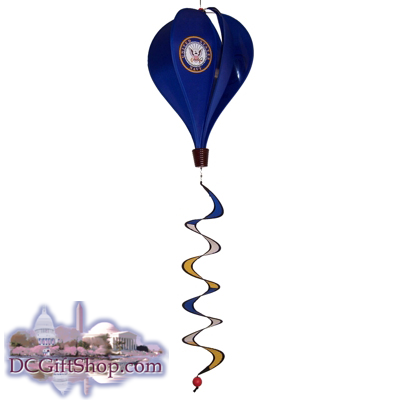 Complete with the United States Navy crest that is silk screen printed on 3 panels the US Navy Hot Air Balloon makes a fun patriotic decoration while also paying tribute to those who serve. An officially licensed product by the Department of the Navy this patriotic display is made with quality weather resistant polyester and measures 16 inches by 12 inches with a 26 inch tail. Supported by fiberglass rods to maintain the balloon shape this item also comes with a hook for hanging as well as strong swivels to attach the spinner tail. The US Navy Hot Air Balloon ship flat and are easy to assemble.